Event Handlers in SSIS is one of the most useful, and powerful feature. At the run-time executables such as Containers, Tasks will raise events. For example, before starting the task OnPreExecute, or OnError event will raise when an error occurs, or OnPostValidate event occurs after validating the task etc. Truncating, or Cleaning tables before we start loading the data. Removing unwanted files after we exported them to other location (or to SQL). Sending Email when an error occurs. 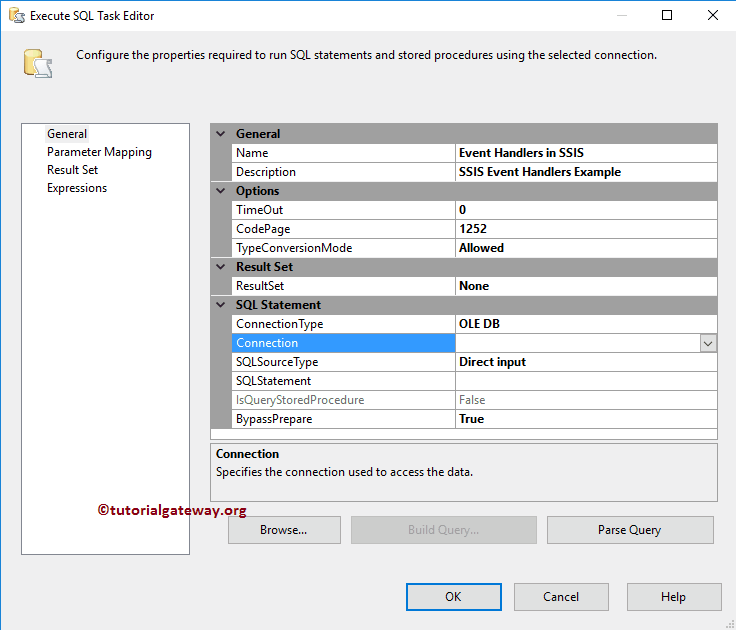 Drag the Execute SQL Task from SSIS Toolbar and drop it into the Control Flow region. 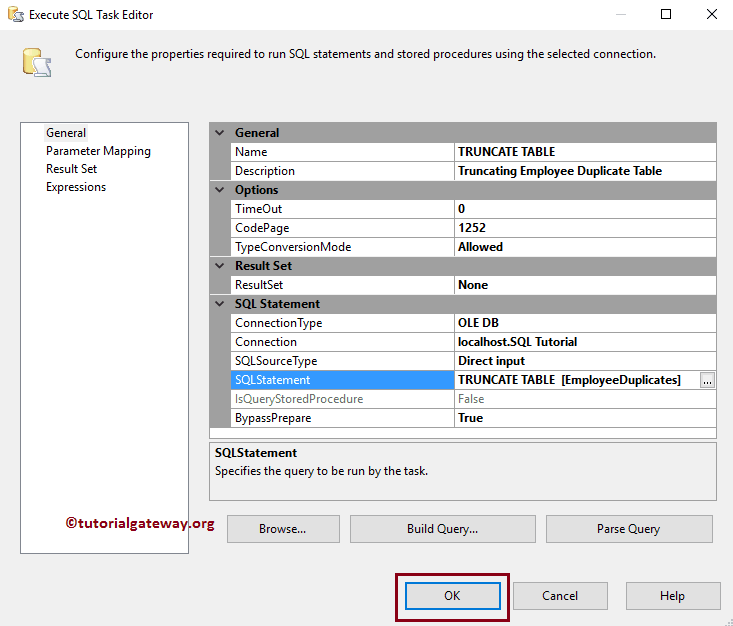 Next, Double click on the Execute SQL Task will open the Editor to configure it. Let me select the Connection Type as OLE DB Connection, which is connecting to SQL Tutorial database. Next, we are using the Direct Input as the SQL statement so, click the … button to write the custom SQL command. Please write your custom SQL statement here. As you can from the below screenshot, we are writing an INSERT INTO Statement to insert four records into the table that we created earlier. Let us run and see whether we successfully inserting records into Employee Duplicate records or not. In order to configure event handlers in SSIS, Please navigate yourself to the Event Handlers tab as we shown below. Executable: You can use this drop-down list to select the Task, Containers on which you want to apply Event handling in SSIS. Event Handler: This drop-down list has all the event. You can select the event that you want to handle. For example, sending an Email OnError event occurs. From the below screenshot you can see we are selecting the Execute SQL task as the Executable. And selecting the OnPreExecute as the event that we want to handle. 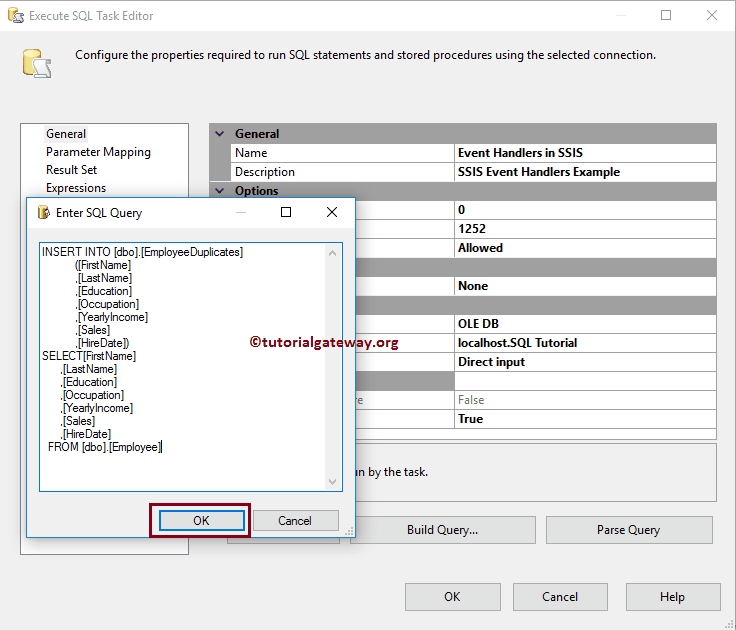 Drag Execute SQL Task from SSIS Toolbar, and drop it into the Event Handlers region. It means, before the package start executing, this Execute SQL Task will execute. Please write your custom SQL statement here. As you can from the below screenshot, we are writing a TRUNCATE Statement to delete the records present in the Employee Duplicate table. Let us open the SQL Server Management Studio Query window to Preview the data. As you can that the package inserted 14 records. Let me add one more task to Event Handler. This time, we are adding a Script Task to handle the OnPostExecution of Execute SQL Task. As you can it is displaying the message after completing the Execute SQL task in the Control Flow region.